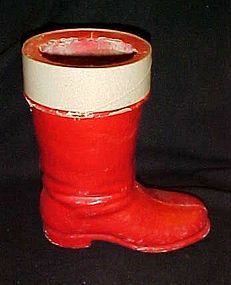 Old 30's paper mache Santa boot candy container 7.50"
Antique Paper Mache Santa Claus Boot Christmas Candy Container 1930's - 1940's. 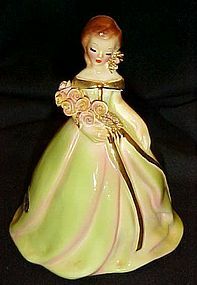 Measures 7 1/2" tall.Good condition with age related wear and paint loss. 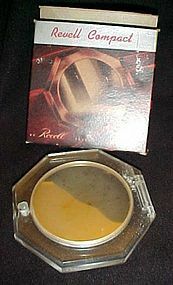 Original cardboard ring around the cuff area. 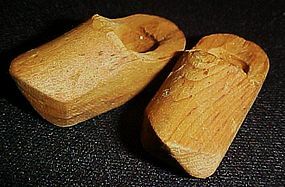 Cute set of hand carved wooden shoes for your Holland Dutch doll. 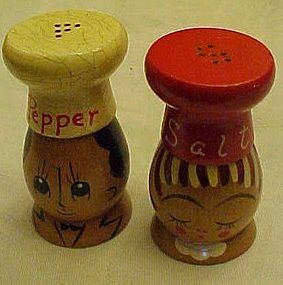 Childs size. 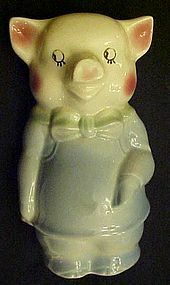 Measures just 2" long. Good condition. I have seen these little clog shoes on the Dutch dolls. 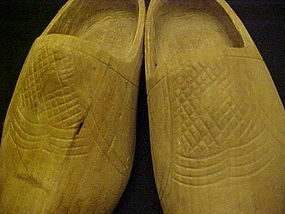 Genuine vintage set of hand carved wooden shoes from Holland. Decorated with carved design but not painted, just natural. Childs size. 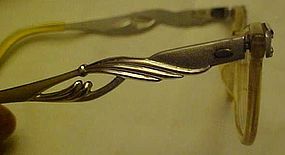 Measures 8" long. Good average condition These were probably worn and not a souvenir item. 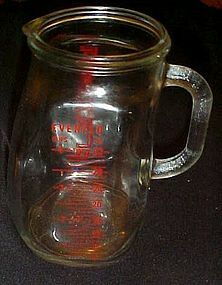 Vintage glass baby nursing / formula pitcher from Evenflo. Great large red lettering, Evenflo logo on front side and the back features graduations to measure the milk. Marked on bottom with a 3. Body is gently curved, wide spout to make pouring into baby bottles easier. Glass is healthiest to use for your baby! 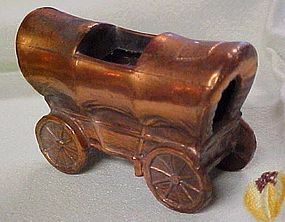 Dimensions: 6 1/2" tall; 5 1/2" across body to handle. Graduated lines for measurement 32 OZ / 4 CUPS / 1 Qt. Very good, clean, no damage, clear glass, great crisp graphics. 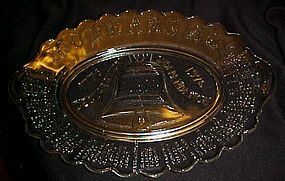 Large Liberty Bell Bicentennial glass platter A.H.R.C. 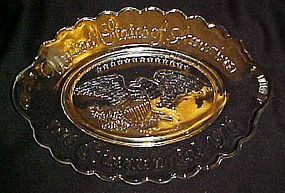 This is a large oval clear glass platter that commemorates the US Bicentennial in 1976. It was made by A.H.R.C. 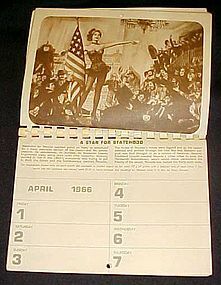 It features the Liberty Bell in the center with the words "1776 Declaration of Independence 1976". The names of all the States and the people who signed the declaration are pressed on the outer edge, with the words 200 Years ago on the top of the edge. Measures 9 1/2" x 13" Excellent condition. Vintage glass United States of America 1776 Bicentennial 1976 oval plate or platter. Great shape with no damages. Beautiful image of the American eagle in the center. Made by Avon. It's about 6 3/4 inches tall and 9 3/4 inches wide with no cracks or chips. 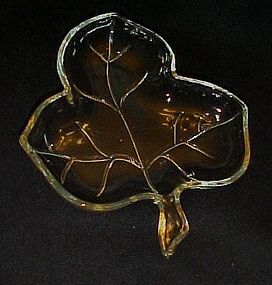 Very pretty Vintage 3 section serving dish in a leaf design. Is in the pretty clear glass. Has 3 sections, for nuts, candy, etc. Hazel Atlas, 1950's. Measures: App. 8" x 7" at the widest point. 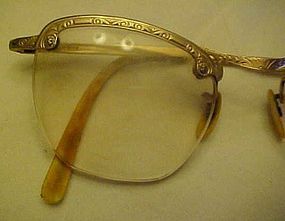 Very Thick glass. Is in wonderful condition, no chips, cracks, or repairs, that I can find. 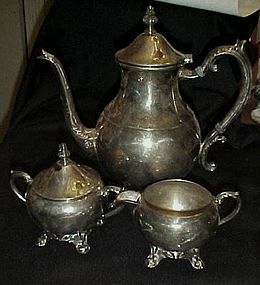 I have 4 available, and price is per dish.Nice for fall or spring decor. Poker Art, wood burning, or Flemish Art, Pyrography was a very popular art in it's day. Some still do this art as it is very nice.This particular vintage piece has a nice carved borner with a pretty scene of a river running under a bridge with houses and a mountain view. Measures 9 1/2" wide. 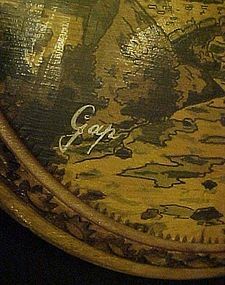 Signed Gap in white. It has been varnished and is in very nice condition.